Turkey is heading to the polls on Sunday for crucial local elections in a polarised political landscape. What should have been a local race between mayoral candidates has turned into a fiercely contested national battle, with President Recep Tayyip Erdogan holding election rallies across the country to avoid a blow to his government. 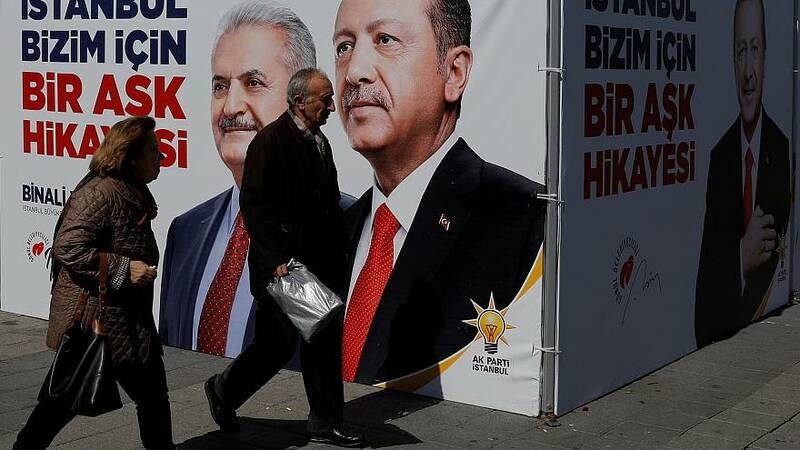 The local polls on Sunday, March 31, mark the first electoral test of support for President Erdogan since he was re-elected in June 2018. Last year's vote had granted Erdogan expanded authority over the parliament and judiciary. The outcome could reshape Turkey’s domestic policy agenda but also US-Turkish relations. Erdogan's Justice and Development Party (AKP) alliance with the Nationalist party (MHP) may indeed prompt a tougher stance against the Kurds in Syria, who have been at the forefront of the Western-backed coalition against the so-called Islamic State. The economic recession is another factor that threatens the ruling party's grip on key cities like Istanbul and Ankara. Inflation has jumped to 20% while unemployment stands at 11%. One-in-five young people are unemployed. Polls show economy and unemployment are among voters’ biggest concerns. Food prices have increased by nearly 30% in Turkey over the last year, according to the Turkish statistical office. This has led Erdogan to declare war on food inflation by turning to unconventional methods to cut prices. Turkey's benchmark stocks index dropped more than 5% on Wednesday. That slide came after the government directed Turkish banks to withhold lira liquidity in order to defend the currency ahead of the elections. Voters are set to elect their mayors and local officials in 81 municipalities. Currently, 49 out of 81 municipalities are governed by Erdogan's AKP. In addition to mayors, 57 million registered voters will elect members of councils and neighbourhood heads for a five-year term. These elections are also the first since President Erdogan took over as head of the new presidential system that came into effect last year, turning into a sort of referendum on his presidency. Izmir, Adana, Bursa, Ankara and Istanbul, the largest cities in the country, are the arena of a fierce battle between AKP and an alliance of opposition parties. Istanbul and Ankara, in particular, are regarded as essential for the ruling party to retain. There are two main alliances running for the elections. The People’s Alliance is made up of Erdogan’s AKP and the MHP, a nationalist party who is against any engagement with the pro-Kurdish party. In response, Turkey’s main opposition party CHP and the conservative Good Party have united into the ‘National Alliance’. The Kurdish votes will be crucial in determining the outcome of the elections. Recent polls show AKP is likely to lose the capital, Ankara, ending a quarter-century-long rule on the city. In Istanbul, Erdogan's hometown, the AKP candidate still has an edge. Polls indicate other big cities like Bursa, Adana and Antalya might well slip under opposition rule.